My wife and I had been away on a long weekend break. On the journey home we decided to take a longer, scenic route which took in the north coast of Cornwall. 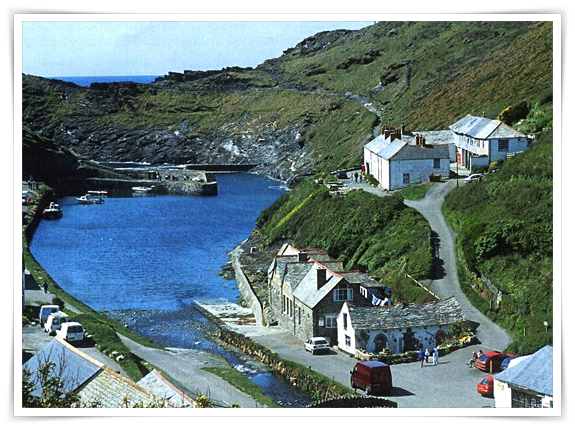 It got to about 11 o'clock and I saw the sign to the coastal village of Boscastle. I asked my wife if she'd like to visit there, so we could have a tea or coffee while overlooking the sea. She couldn't make up her mind, but I took the turning anyway. When we reached Boscastle I drove into the only car park. As it was out of the summer season the very large car park was virtually empty, so we found a spot to the middle of one side. As we parked another car stopped directly behind us about four rows back. My wife went to the back of our car to make some tea - we had a flask of hot water, milk and tea bags with us. I glanced in my mirror and remarked to my wife that the man in the car behind us looked like Mick, a friend of some 30+ years. To cut a long story short it was our friend and his wife. Now they live some 150 miles from where we live and they too, unbeknown to us, had also been on a weekend break. They were also on their way home, some 180 miles away. (1) They arrived at the car park a couple of minutes after us. (2) They parked directly behind us, when they could have gone anywhere in the car park. If they had we may well have missed them. (3) Neither of us knew the other would be anywhere near Boscastle. (4) As Mick and his wife drove into the car park they were talking about coincidences! It's a funny old world! What an amazing meet-up! Things like this do make me wonder. I think it's a good reminder that it is important to stay connected to friends even when they are far away. The village looks beautiful and I looked up to discover that there is lots to see, including a museum of witchcraft! Well it does make you wonder but whatever the case it was a lovely encounter I'm sure. Thanks Heather, I always wonder why certain things happen - do they have a meaning and so on. Yes, was nice to see them at the time. What a coincidence. Surely meant to be. Bumped into a niece una pub in St Ives one night. It was lovely to see her as I was missing our daughter as she's grown out of holidaying with us for now. We had a drink and listened to live music in a pub. Lovely. Meant to be. Thank you. Coincidences are interesting - and some can be very meaningful. That must have been nice meeting with your niece. Hello Mike....serendipity...such a delightful word for a happy coincidence!! Thanks Margaret - love that word, it flows off the tongue. I find coincidences fascinating.